Over the weekend, we got a small glimpse at what the Jordan CP3.VIII "Christmas" will look like. Today, we finally get a detailed look at the final Jordan Brand holiday shoe to be revealed. Out of all the Jumpman&apos;s Christmas Day shoes this season, the CP3.VIII probably best evokes the holiday spirit. Sticking to Jordan Brand&apos;s holiday cardinal red and metallic gold motif, the sneaker sports an all red upper with metallic gold detailing on the eyelets and signature branding. The black tongue also receives a metallic gold finish, while the midsole is covered in a cardinal red and metallic gold zig-zag pattern, much like the one we saw on the Super.Fly 3&apos;s upper. With the Clippers set to play the Warriors on Christmas Day, we should see both the CP3.VIII and Super.Fly 3 on-court with both Chris Paul and Blake Griffin in action. 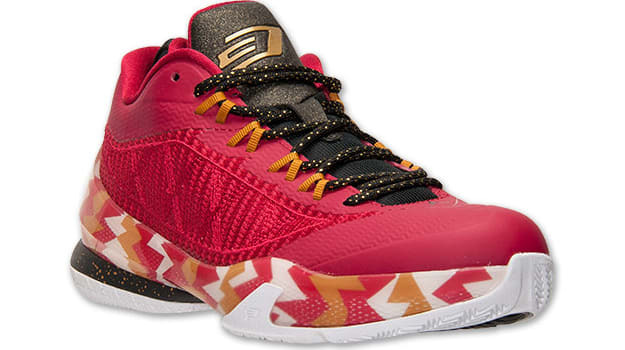 Check out the Jordan CP3.VIII "Christmas" above and pick up a pair when they drop on December 24 for $130.